This time, the failure is not in domain restriction of course, but in failing to acknowledge the intended communicative force of the question. Instead of taking the server's question to be something akin to "Addressing myself to each of you, what do you want from the bar?" the logicians interpret it literally and uncooperatively as a yes/no question—the answer to which only the last of them is in a position to deduce based on the answers given by the other two. By the way, if you've ever gone to a bar with a logician, you know that they are likely to engage in just this sort of behavior as a form of tickling themselves. Cute, but is the waitress not in the universe of discourse? The "politically correct" version would have the last guy saying, "Yes, but I'm driving, so make mine an O'Douls." I didn't get the joke until the 3rd time I read it. I expected the problem to be domain restriction, until I realized that the last "yes" was applied to the correct domain, and that it had to do with the knowledge gained from the other replies. @Carl: but is the waitress not in the universe of discourse? And indeed everyone (see Shel Silverstein's hot dog and the domain of "everything"). Unless the last respondent has solved the problem of knowledge of other minds, I don't see how he/she can be any more certain than the other two, unless the questioner is one of the three logicians, and they have walked into a bar with a normal person. @rgh: That's easy: if any one the first 2 logicians didn't want beer, he/she would've replied "no" (since he/she doesn't beer, not 'everyone' wants beer). Given their 'I don't know replies', you can infer that they *do* want beer, but don't know if *everyone* does. @rgh: If logician 1 or 2 did not want a beer, this would suffice to answer "No". So their answers imply that each of them does want a beer, but cannot vouch for the others. The cartoon Ben linked to has an interesting bit for linguists: Since "chai" is the Hindi word for "tea" (or at least it is the word I was taught for tea! ), the last fellow is requesting "tea tea." It seems to me that this is somewhat different from other recent posts on this issue. There is pragmatic ambiguity in this question. The participants could reasonably interpret the question as pertaining to the entire group or each individual. A reasonable (pragmatic) answer could be, 'I do' or 'I don't,' 'yes' (we all do) or 'no' (not all of us do). Compare this to the case of "but do you LIKE HIM like him? ", that is, given there are iced teas, green teas, herbal teas, and a particular set of blends and styles of preparations called chai – Russian, I thought, but many languages are close here, Mandarin Chinese is Cha(rising tone), the repetition lets you restrict the meaning to the order you mean. I would like the "cotton shirt" Tee. I would like the "steeped leaves in hot water" tea. So, as far as I can tell, everyone who wanted beer got beer. What's the problem? MattF:The first two may want beer and not get it. In fact, if the first two both want beer, they will get it. If the first two want beer, the only other possible set of answers is "I don't know", "I don't know", and "no", and in that case the first two will get their beers and the third, who does not want a beer will not get one. However, if the first or second person doesn't want a beer, then the third person may or may not get a beer, depending on the persistence of the bartender. MattF: The waitress could interpret their answer as they, as an individual, are undecided. Or, she could interpret it as they don't know if every member of the group wants beer leaving her without knowledge of their personal wishes. 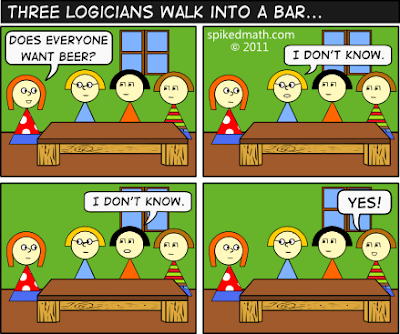 If "everyone" includes the waitress (but she might be the 4th friend), than the third logician's answer could be "I don't know" too, and they would still get their beers. Not true. Etymology is not destiny. And, in particular here, the meaning of a word in the language it's borrowed from is not always the same as the meaning in the language it's borrowed from. While there is some redundancy in staying chai tea, it's not at all the same as saying "tea tea". True, true. In Romanian, one can say *Un ceai Chai, va rog. `A Chai tea, please`, 'ceai' (the Romanian borrowed the word from Russian) and 'Chai' (the brend name) having almost the same pronunciation. the meaning of a word in the language it's borrowed from is not always the same as the meaning in the language it's borrowed from. Er, tautology failure. Typo, or am I missing something? At least in the US, 'chai' usually means a spicy sweetened milky beverage with — often — a tea base. (I've seen rose hip, rooiboos and maté variants at least.) So the 'tea' in 'chai tea' isn't even necessarily redundant, though I agree with Joe that it's the 'chai' part that more often varies. The term's derived from 'masala chai' (= spiced tea), not plain old 'chai'. A sentence conveying the intended meaning (as I suppose) results from the replacement of exactly one of the "from"s in the original statement with an "into". A slightly different tautology results from the replacement of both of the "from"s in the above sentence with an "into". Is the use of prepositions (or postpositions, if your language swings that way) to convey non-positional information (information not related to location of physical objects) a linguistic universal? @Marcos. I guess you could loosely call it a typo. That second from should be a "to". I don't know that it's universal (not even sure that adpositions are universal), but it's pretty widespread. Spatial relations are used for temporal relations (The meeting is IN the conference room IN the morning). They're extended to possession (The inheritance went TO John) and ascription (The light went FROM green TO red). Jackendoff's Foundations of Language, section 11.7, is a good place to start if you want citations. And not all adpositions derive from spatial terms — Croft (Typology and Universals, 2nd ed) gives an example of a dative preposition coming from a verb meaning 'give', and 'because of' from a noun 'sin'. Even if "everyone" is taken to include the person asking the question, the third logician can still answer "yes." If the questioner is included in "everyone," then if she herself does not want a beer, then she already knows that the answer is "no," so [okay, a bit of a pragmatic leap here], why would she ask? It is interesting that the logicians are cooperative enough not to include the waitress or even the whole universe in their understanding of "everyone," but fail to answer the question the way it is intended. I think I'd call this a deliberate but focused kind of obtuseness. We cannot tell whether the third logician wants beer or not. The situation worsens if the first logician answers "No." "Only guide dogs are permitted on the school site". That would seem to severely limit the possibility of any child education taking place there. (I think you may know them as Seeing Eye dogs in the US). Given that guide dogs can't read and the humans usually accompanying them can't see, wouldn't there be a rather low take-up of this permission? Joking aside is there a better way of expressing what was intended, eg "No dogs other than guide dogs allowed on the site" ? @ Miles B: "No pets"? Apart from teacher's pet, of course! I've often seen "no dogs except guide dogs" which seems both succinct and unambiguous. "Not true. Etymology is not destiny." Yes, Ellen K., I certainly understand what has gone on here. I was just noting a curiosity. @Spell Me Jeff – the joke still works even if the waitress is included. She must want beer else she wouldn't ask the question. How do they know that they're supposed to answer in a fixed order from (the bartender's) left to right? Couldn't it be that they all pause just long enough to realize that anyone who didn't want beer would have answered "no" by that point, and then someone simply says "yes"…or, if the bartender is known to be logically astute, they don't say anything at all and she gets the beers after a few seconds. I've seen "No pets (service animals OK)" and similar signs. In the US "service dog" is the usual term, since they can also be used to assist people with other disabilities than visual impairment. "Chai tea" is a usage I've only started to hear recently. Before that, "chai" was something you had instead of tea. The schools here have signs listing things that are not permitted on school grounds, such as smoking, unleashed dogs, etc. But one of the items is "illegal substances". That has always seemed a bit unnecessary to me. …and actually, isn't that not too far off from what happens with ordinary people? Look around to make sure that everybody has heard the question, give a few moments for somebody to object, and if nothing happens then somebody (closest to the asker, maybe) says "sure"? Yeah…I tried arguing once that my hunting knife wasn't an illegal substance, because steel and leather are the substances and they're perfectly legal on school grounds, whereas "knife" was merely the form. Turns out school security aren't up to speed on their Aristotle. Giacomo Ponzetto'sinterpretation is right, but there's another element to the joke that everyone seems to have missed: it's a reference to the famous Hat Puzzle. Interestingly, if the title was "Two logicians and a pragmatist walk into a bar" the exact same speech bubbles tell a different joke, with the final exclamation being frustrated rather than triumphal. And in answer to how a real barmaid would respond to this (assuming it's not the Maths Department's student bar), she would of course give the third guy a beer and assume the other two needed time to decide. In her head, she's asking them what they want to drink, and they're replying "I don't know", so what else would she assume? Wow, that Wikipedia page about the Hat Puzzle is not very good. It claims the puzzle dates to 1998 (when it's decades older) and only discusses a couple very particular versions. I have gotten into the habit of expecting Wikipedia to be fairly accurate when it comes to uncontroversial topics, but it's good to get an occasional reminde like this of how bad it can be. The hat puzzle is a classic logic problem, attributed to Todd Ebert, in his 1998 Ph.D. thesis at the University of California, Santa Barbara. And while I do think it's natural to read "attributed to Todd Ebert, in his 1998 Ph.D. thesis" as meaning it goes back to then, the "classic logic problem" seemingly contradicts that interpretation, leaving the origins unclear. I remember in college when the teacher would ask: "Does everybody understand?" and then get mad when no one answered. I certainly did not feel qualified to say yes, everyone understands! My father, who was a common working man, used to tell the story of having a drink in a bar, and when he had finished the drink being asked: "Would you like the same again?" His reply was: "I would, but since that's impossible, please give me something very similar." @maidhc: "Chai tea" is a usage I've only started to hear recently. Before that, "chai" was something you had instead of tea. For me (English, 10-something) , "chai" has been a foreign word for "tea" for most of my life. Recently its been used as a marketing term for Indian-style spiced tea, which my inner pedant wants to call "masala chai", and seems to have taken off like that, so now if a shop advertisises "chai" that's what they mean. . I almost wish I was a langauge peevologist so I could tell people how utterly WRONG they are! It feels very recent to me – five years maybe? – but no doubt someone will find a use older than that. I mean calling it just "chai" is very recent – the stuff has been around for decades but I would have thought of it as "Indian-style tea" before. Never very common, but you saw it in some places. @Peter: And rather hilariously, the "chai tea" with which "tea tea" is being contrasted, itself means "tea tea". You've just set yourself up for a lecture from Ellen K, Lazar! The puzzle is making some non-trivial assumptions about the "know" and "want" modalities. In order to infer "he wants beer" from a logician's "I don't know," you need a premise like "he wants beer if and only if he knows that he wants beer." Otherwise, you can't rule out the possibility that one of the guys says "I don't know" because he doesn't know whether he wants beer. @Luis: I think there's a whole list of additional premises that are implicit to make the logic work. For example: 1. that the logicians speak in the order left to right; 2. that each logician knows that the other logicians know when they want beer. Actually, I'd forgotten that the cartoon has separate frames, so I guess premise 1 is not required. Most people here (and indeed the third respondent) assume that the first two respondents do want a beer but answer "I dont know" because they can't know what the other(s) want. However, what if either or both of the first two respondents didn't want a beer but still answered "I dont know" for the same reason? Isn't the third respondent then incorrect in saying 'Yes'? myl – I disagree. The question is addressed to the group ("everyone"), not the individual. So the first and second respondents can only answer "I dont know" regardless of their personal condition. Will, the question is addressed to the group, but if you know you personally don't want beer, you know everyone does not want beer, so your answer to "Does everyone want beer?" is "No."